14k Gold diamond cut Monkey pendant. Pendant measures 22mm in length by 17mm wide before the bail. 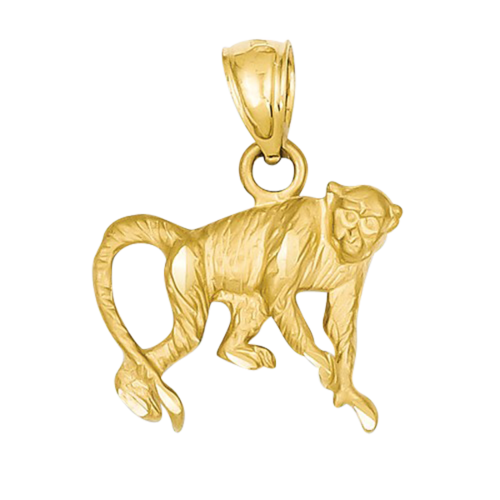 A detailed charm, open back and features a satin and diamond cut finish. Mystical 14k gold dolphin slide pendant. 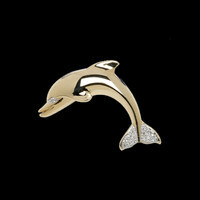 This beautiful dolphin features a polished finish and is set with .09ct tw round diamonds in the tail and eye. Great design measures 1 inch by 1 1/4 inch. Whimsical 14k yellow gold Carousel horse pendant. 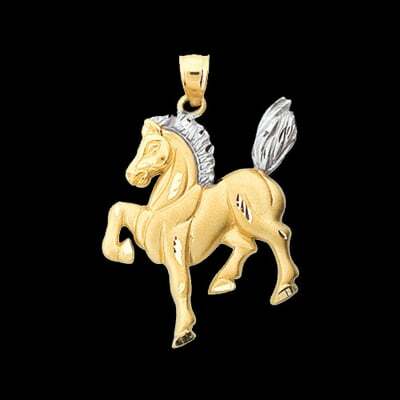 This charming horse pendant measures 23mm in length by 27mm across and weighs about 3.8grams. Pendant has an open back and polish and texture finish. 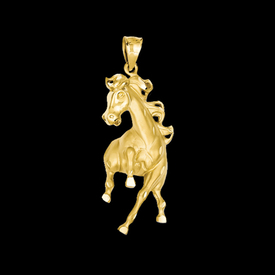 A memorable horse pendant. 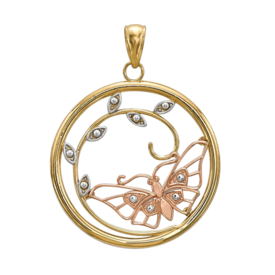 Adorable 14k yellow and rose gold with rhodium Butterfly in Circle pendant. This pendant measures 33mm top to bottom by 26mm wide. A whimsical pendant for every day wear. 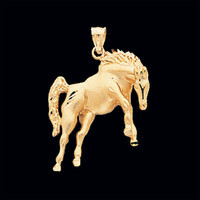 Gorgeous 14k Two Tone Gold spirited Horse pendant. You'll love this proud horse showing his muscles and pride. He measures 1 1/2 inchs in length by 1 inch across. Features on this great Horse include a satin finish with diamond cut accents. Very substantial pendant at 7 grams. 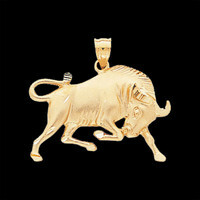 14k Gold snorting bull pendant. Strong bold bull measures 1 and 3/16 inch wide by 1 and 1/16 inch long including the bail. He weighs about 4.4grams, not the largest bull in the pen but defiantly mighty. He's available in 14k Yellow, 14k White, or 14k Rose gold. You'll love his strong Bull pendant. Beautiful 14k gold galloping horse pendant. 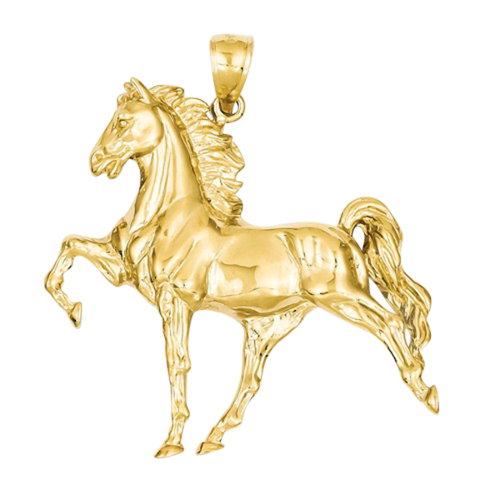 This stylish horse pendant is available in a 14k yellow or white gold and features a satin body with polished hooves and diamond cut accents. He weighs 5.3grams. 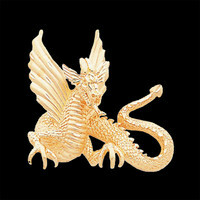 Magnificent 14k gold horned dragon pendant. This incredible Dragon pendant design measures 1 7/16 inches wide by 1 3/8 inch long and weighs about 9.7grams. He's available in 14k Yellow, 14k White, or 14k Rose gold. This mighty dragon features a texture and satin finish . You'll love his strong presence. Adorable 14k yellow gold pretty pony pendant. 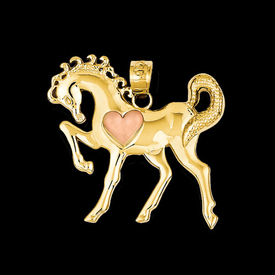 This pony pendant features a rose gold heart on her shoulder with a polished body and textured tail. She measures 21mm nose to tail and will bring a smile to anyone's face. 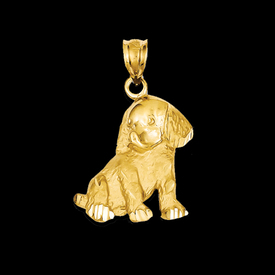 Precious 14k gold Puppy charm pendant. He's just adorable with diamond cut accents and a satin finish. He measures 20mm top to bottom and weighs about 2.41grams. 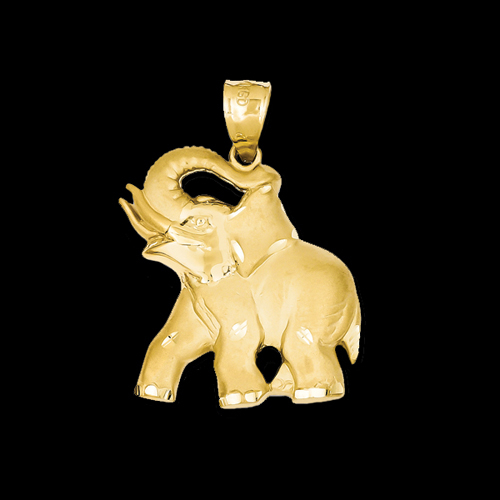 Happy 14k Yellow gold Elephant pendant. This beautiful Elephant features a satin finish with diamond cut accents. He measures 27mm in length and weighs about 5.47grams. Elephant has two beautiful tusks and his trunk up high, his back is open and textured. 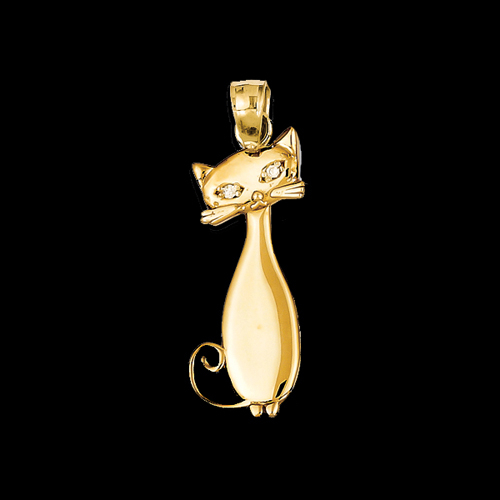 Adorable 14k yellow gold Kitty charm. This kitty features diamond accent eyes and measures 20.5mm in length. She's just lovely, you'll want to wear her everyday. 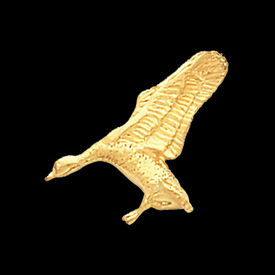 14k gold soaring Pelican pendant. Gold pelican measures 40mm in length by 24mm across. This pelican weighs aprox. 3.7grams. A great pendant for anytime. Fun 14k gold landing duck pendant. This pendant is available in 14k yellow or 14k white gold. Duck measures 19mm wide by 16mm long. 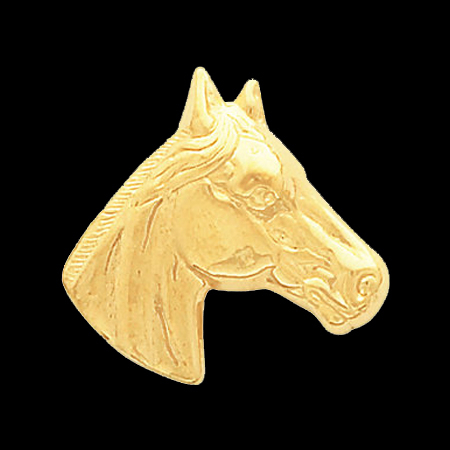 Lovely 14k gold horse head pendant. This strong horse measures 23.00X23.00 MM and is a great gift for the equestrian in your life. 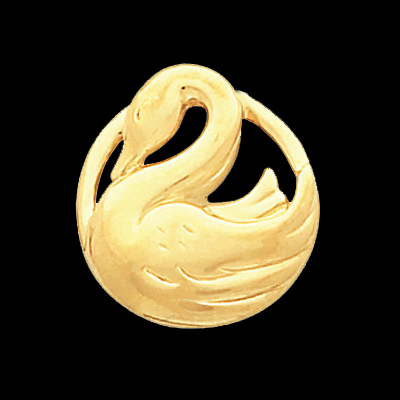 14k yellow gold sitting swan pendant. 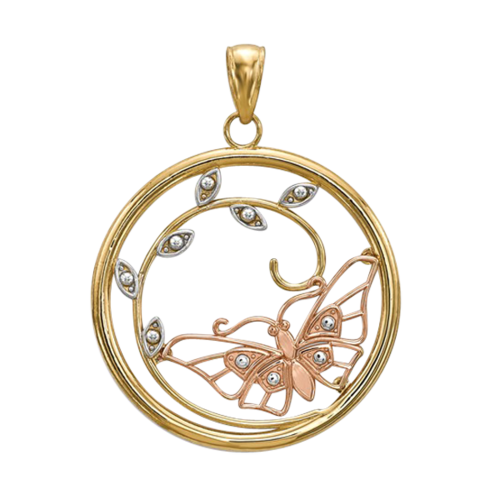 This delightful pendant features a polished finish. Lovely Swan measures 18.25mm in length by 17.25mm wide. Pendant weighs 4.34grams and features a hidden bail.